The nation of Israel almost didn't become a a nation because of rabid anti-semitism being fostered within the nation that would become its greatest friend since 1948. In a letter sent by Chaim Weitzman sent to then President Harry Truman on May 13th of 1948, then President of the Jewish Agency for Palestine, Weitzman asked Truman to recognize their new state. At the time, the Zionist leaders had not even picked out a name for the new state and were arguing over the name whether it should be called Judea, Zion, or until somebody out of left field invoked the question “What about the name Israel?” Weitzman was asking Truman for recognition of a then nameless state. Eban served as the Ambassador the the UN and Israel Ambassador to the USA before becoming Israel's foreign minister. Eban was a man with a quick wit and spoke his mind and was present at every major event involving Israel until his departure from the Knesset in 1988. He fought rash Anti-Semitism wherever it raised it's ugly head. He once proclaimed that if “Algeria introduced a resolution declaring the earth was flat and that Israel had flattened it, it would pass overwhelmingly with a vote of 164 to 13 with 26 absentions. “The days of our years are threescore years and ten; and if by reason of strengththey be fourscore years, yet is their strength labour and sorrow; for it is soon cut off, and we fly away.” (Psalms 90:10). 2”Thus saith Cyrus king of Persia, The LORD God of heaven hath given me all the kingdoms of the earth; and he hath charged me to build him an house at Jerusalem, which is in Judah. 3Who is there among you of all his people? his God be with him, and let him go up to Jerusalem, which is in Judah, and build the house of the LORD God of Israel, (he is the God,) which is in Jerusalem.” (Ezra 1:2-3). It has been pointed out, that God may have raised up POTUS Trump as a modern day Cyrus to bring to pass the rebuilding of the Jewish Temple in Jerusalem. Rabb Hillel Weiss spokesman for the Sanhedrin, contacted Breaking Israel News to announce that the election of Trump, who has promised to recognize Jerusalem as the capital of Israel, coupled with Putin’s expressed desire for the Temple to be rebuilt, prompted the Jewish court to send a letter offering the two the opportunity to act as modern-day Cyrus figures: non-Jewish kings who recognize the importance of Israel and the Temple. Since the election of this new administration the tone and support of Israel has done a 180 degree turn-around from the outgoing POTUS, the “traitor in chief” to voicing undying support for our only democratic ally in the Middle East, the nation of Israel. 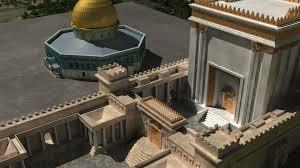 Has God appointed two “kings” of two nations, to bring the Jewish Temple to fruition? If God has chosen Trump to bring this to pass, there is no stopping a POTUS Trump, as God will protect him so that His will be done concerning Israel. What the role of Putin will be may be found in the Gog-Magog coalition that is forming right now. After such devastation, a man of great superior diplomatic skills, a charismatic individual will arise who will bring a “false peace” to the area and allow Israel to rebuild their Temple and assure they will be protected by his regime. To try and speculate who this man is, is an exercise in futility, as we may have an idea, but I believe we will never know, this side of the coming of Jesus Christ for His Church. President Trump has given the green light for returning the U.S. Embassy to Jerusalem, thus recognizing Jerusalem as the undivided captial of Israel. So we see the domino lining up for the rebuilding of the Temple in Jerusalem. How long? If the covenant is made with Israel, and the go ahead of the Temple is ratified, it could happen within 3 months, as all the building blocks are ready for immediate construction. This could all fall into place in lightening speed. When will this war of Ezekiel bring a clamor for the rebuilding of this Temple? If you look at the region right now, the Arabs, Iran, and Russia are on the borders of Israel to the north, to the east, and from the northeast of the Golan Heights, Lebanon with Hezbollah, Gaza with Hamas and the Russian Bear supporting them all. It could happen in a flash, but it will be a quick war. As God has said He will fight for Israel and 5/6 of this invading army will be destroyed with the plague of destruction following the survivors back to the home country. Note that one event leads to another....the Anti-Christ is alive today and he will make his appearance when God says he will make himself known, but one thing will happen first. 6”And now ye know what withholdeth that he might be revealed in his time. Notice that one must proceed the other...there is a power that is holding back evil to rule this world with a hindrance. The evil is Satan and his demon hordes that wish to destroy mankind, but receive worship for himself beforehand, as he knows his time is short...THEN that power (the Holy Spirit) which is the only power that is keeping evil in check according to God's will for men to choose either good or evil, will be removed from HIS fullness....But those who have the earnest deposit of God's Holy Spirit will be removed prior to this revealing of the Anti-Chirst. It all centers around Israel. Never has there been a people, a nation that has caused so much turmoil by just existing, as the tiny nation of Israel which is no bigger than New Jersey...Why? Because Satan hates Israel and explains the rabid hatred of anyone, or anything that supports their existence. Why do you think that there is so much opposition to POTUS Trump? Liberals hate anything that speaks of the God of Israel and when a POTUS supports Israel, as this President does, it gives them even more reason to hate him. They may be opposed to conservative policies, or “draining the swamp”, but backing it up is the forces of Satan putting the idea of rebellion in the hearts of a godless half of the country, epitomized by the Democratic/Communist party. But God is in control and no one can thwart His will. 4And saying, Where is the promise of his coming? for since the fathers fell asleep, all things continue as they were from the beginning of the creation.” (2nd Peter 3:3-4).